We arrived in Kona around 9 am which let us have a relaxing morning on the boat. One of the highlights on the boat for our little fam was the Lido deck which is a buffet and dining area that spans pretty much the entire deck. There are indoor and outdoor dining options and it’s self-serve. Every meal was like a little adventure for the boys as they tried all the different foods. We took our time eating breakfast and ate outside as we watched boats come in and out of the harbor. Today was our helicopter tour that we booked through Carnival On Shore Excursions. There is so much to do on each island so looking through the On-Shore Excursions is definitely worth it if you have a specific experience in mind. Hawaii is the largest of all the Hawaiian Islands and is referred to as the Big Island. We have been to Kona before so we wanted to make the most of our time and see as much as possible. We figured what better way to see the island than from the air. When we arrived at the dock the shuttle for the helicopter was waiting for us. They had a weigh in which was kind of funny because they made everyone do it. Nothing more awkward than standing single in a file line with a bunch of strangers getting weighed :) The drive to the helicopter facility is about 45 min and you drive past all the dry lava fields. The Big Island has so much to offer with many different landscapes. It’s the one island that actually gets snow, so you surf in the morning and snowboard in the evening. When you drive around the island you'll drive through; beach, forest, dessert, mountain, jungle and lava fields. The views you see here are unlike anywhere else in the world being on an island in the middle of the ocean! Last little fact is the Big Island is the youngest of all the Hawaiian Islands and it is made up of 5 volcanos and 1 of the volcanos is still active, Kilauea. Getting onto the helicopter was like being a kid again having that nervous/excited feeling doing something for the first time. Ira and Tama were so cute, their expressions of not knowing what to expect and excited to go on this new adventure, just so many different emotions all at once! 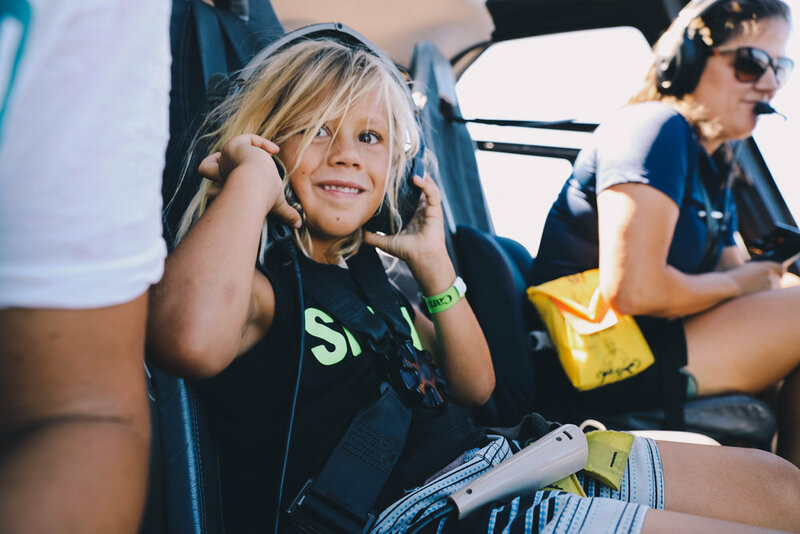 Our pilot’s name was Merl and she made it fun for the kids by playing little guessing games over the headsets they got to wear. 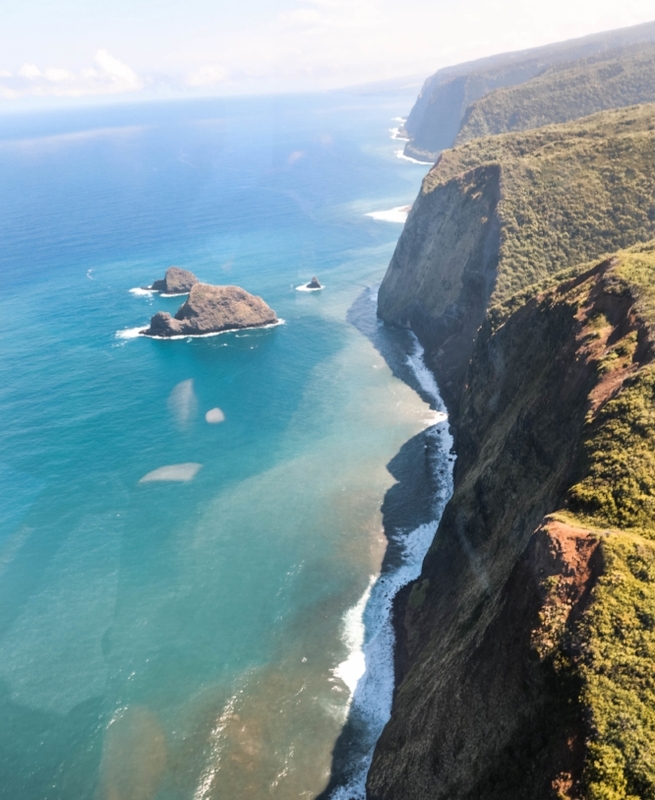 Flying in a helicopter over Hawaii gives such an incredible perspective of this beautiful island. 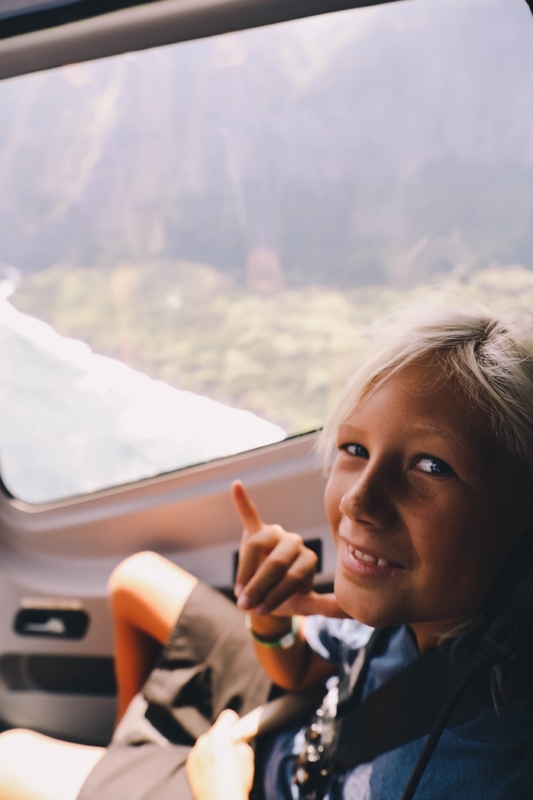 We started by flying over the ridge of Pololu Valley where there were waterfalls everywhere. Merl then flew us down the coast line where we could see dozens of waterfalls flowing into the ocean. It was a clear day so we could see straight down the coastline to where the island ends and out to the horizon. We then went down to Waimea Valley and past a WWII plane wreckage in the jungle below. We were just so stoked to experience this together. We arrived back at the harbor with a few hours so we took the kids to get some natural shave ice and walk the strip in Kona. There are so many cute little shops that you can stop in at. Many of the restaurants in Kona are set right on the ocean so you can have an amazing meal with a priceless view. We also stopped in at the farmers market to check out some of their local produce. Kona is a cute little town and is a great stop to do some shopping, grab a bite or just cruise the strip. The boat left at 5 which was kind of early so we asked the kids what they would like to do. To our surprise they wanted to go back to the Ocean Club before dinner. We let them go for an hour and when we picked them up they were so excited because Tama won a little trophy for the best necklace made! It was really cute how proud both the boys were that he had won. This post was created for Away We Go with Carnival the destination for getting in the getaway state of mind.